Piggle-Wiggle, Mrs. (Fictitious character); Fiction. From her upside-down house, the eccentric Mrs. Piggle-Wiggle cures such common children's diseases as won't-put-away-toys-itis, answerbackism, and fighter-quarrelitis. Mrs. Piggle-Wiggle lives in an upside-down house ans smells like cookies. She was even married to a pirate once. Most of all, she knows everything about children. She can cure them of any ailment. Patsy hates baths. Hubert never puts anything away. Allen eats v-e-r-y slowly. Mrs Piggle-Wiggle has a treatment for all of them. The incomparable Mrs. Piggle-Wiggle loves children good or bad and never scolds but has positive cures for Answer-Backers, Never-Want-to-Go-to-Bedders, and other boys and girls with strange habits. '[Now] in paperback . . . for a new generation of children to enjoy.' -- San Francisco Examiner Chronicle. 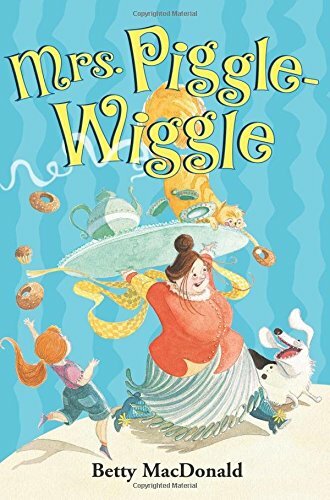 With Alexandra Boiger (other contributor) | New edition from Harpercollins Childrens Books (June 1, 1975); titled "Mrs. Piggle Wiggle"
About: From her upside-down house, the eccentric Mrs.